Imports stood at 3.59 million tons worth $5.99 billion, down 42.68% and 34.92% in tonnage and value respectively YOY, according to Financial Tribune. Iran mainly exported gas condensates, liquefied natural gas, low-density oils and mineral oils to Persian Gulf nations. In exchange, major commodities imported from the Persian Gulf states included cellphones, steam turbine parts, butter, boneless frozen cow parts and turbojet parts. In terms of total trade value, the UAE topped the list with bilateral trade standing at 16.33 million tons worth $11.46 billion, down by 27.17% and 23.64% in tonnage and value respectively YOY. Exports to the UAE amounted to 12.81 million tons worth $5.54 billion to register a 21.29% and 6.69% decline in tonnage and value respectively YOY. The UAE was Iran’s second biggest export destination among the countries under review and third among all countries. In return, the UAE exported 3.51 million tons of commodities worth $5.91 billion to Iran, down by 42.75% and 34.74% in tonnage and value respectively YOY. The UAE was the top exporter of goods to Iran in the Persian Gulf and second among all countries after China. Major Iranian commodities exported to the UAE were gas condensates, low-density oils and mineral oils. The UAE mainly exported cellphones, steam turbine parts, butter and boneless frozen cow parts to Iran. Iraq was Iran’s second biggest trading partner among Persian Gulf littoral states during the 11 months, as two-way commercial exchanges stood at 18.46 million tons worth $8.29 billion to register a 52.11% and 40.9% growth in tonnage and value respectively YOY. Iran exported 18.39 million tons of goods worth $8.23 billion to Iraq, up by 53.09% and 42.02% in tonnage and value respectively YOY. Iraq was Iran’s top export destination in the Persian Gulf and second among all countries during the period. Iran’s exports to Iraq included natural liquefied gas, mineral oils, household cleaning detergents and tomatoes. Iran imported 67,219 tons of commodities worth $53.57 million from Iraq, down 44.51% and 36.33% in tonnage and value respectively YOY, which were mainly low-density oil, machinery, aluminum alloy and cans. Iraq was the seventh exporter of goods to Iran in the Persian Gulf and 41st exporter to Iran among all countries. Kuwait was Iran’s third major trading partner among the states under review. Mutual trade between Iran and Kuwait amounted to 3.35 million tons worth $224.99 million, indicating a 31.53% growth in tonnage and 1.23% decrease in value YOY. Iran’s exports reached 3.34 million tons worth $233.69 million, up 31.36% and 5.74% in tonnage and value respectively YOY, while Kuwait’s exports to Iran were at 8,822 tons worth $11.3 million, up by 164.78% in tonnage and down 58.22% in value YOY. Kuwait was Iran’s third export destination and also the third exporter of goods to Iran among Persian Gulf states. The country was Iran’s 18th export destination and the 66th exporter to Iran among all countries during the period. Clinker, plant products, Portland cement and sponge iron products were Iran’s main goods exported to Kuwait, while Kuwait exported benzene, rubber, vehicles and screw compressor air ends. Trade with Iraq (at $8.29 billion) saw the highest YOY growth of 40.9%, while trade with Saudi Arabia ($360,397), the UAE ($11.46 billion) and Bahrain ($11.6 million) witnessed the lowest decline of 83.66%, 23.64% and 17.39% respectively. 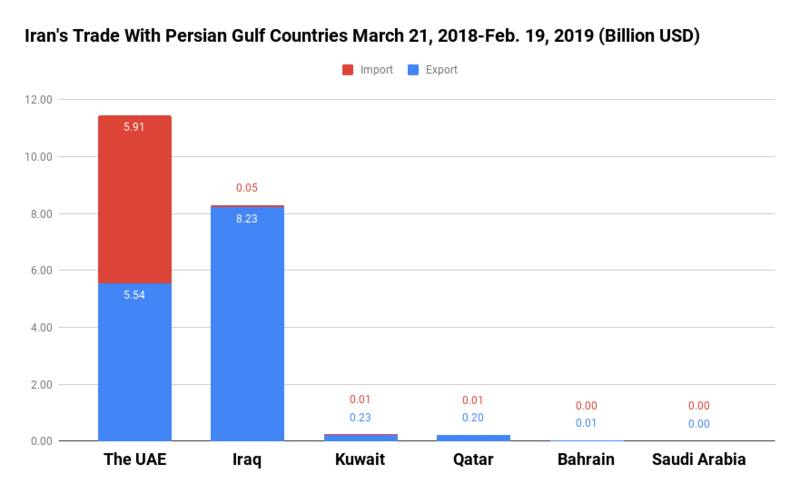 Iran’s exports to Iraq ($8.23 billion), Kuwait ($233.69 million) and Bahrain ($10.78 million) saw the highest growth of 42.02%, 5.74% and 1.37% respectively, while exports to Saudi Arabia ($109,063), the UAE ($5.54 billion) and Qatar ($204.72 million) witnessed the highest decline of 86.53%, 6.69% and 2.32% respectively. Imports from all the six Persian Gulf nations witnessed a year-on-year decrease. Imports from Saudi Arabia ($251,334), Bahrain ($812,013) and Qatar ($8.12 million) witnessed the highest decline of 82%, 76.12% and 63.88% respectively.